Anyone rolled their car? It's a pretty cheap method and with enough prep and cutting and buffing, I've heard that it can look pretty nice. I recently traded my SRT4 for a diesel 99 F250 and it's far from pretty but it's exactly what I wanted. Extended cab, short bed, 4x4, couple mods, but it's still in pretty crappy condition cosmetically because it's been a work truck. There are a few minor dents and dings, but nothing big, but the paint is in pretty rough shape, more than my buffer could ever thing about repairing. So I've been looking into rolling it on myself this summer. Anyone got any experience with doing this? Any tips? We saw one truck at an event that had the bed liner material either rolled or sprayed entirely. Very durable, will never rust, and almost guaranteed to last a lifetime! Just a thought! My plan is to roll most of the truck white and do the rocker panels in bedliner. Not a fan of the entire bodies being bedlined, just doesn't look right to me... the texture looks off to me. I will be lining the bed and maybe the rockers for sure though. I would not even attempt this..............you'd be better off to spray it in your back yard then roll on the paint with a roller. There's a link to when HotRod did it a few years ago. EvilZ- Any particular reason you're against it? It seems cheaper and a bit easier to deal with than spray because you don't have to deal with overspray and quite as strong fumes. I don't really have anywhere to spray the truck and for a couple hundred in materials and a couple weekends of work, this seems to be a decent idea. The reason I'm against it is unless you are an experienced body man that knows how to wet sand as well as cut and buff it's going to look like crap. Also since your going to have to use single stage paint unless you really stay after it it won't look good for more then about 2 years tops. I'm not saying it can't be done but don't expect this to be an easy task. I have a very nice HVLP gun, and you can find paint kits that come with everything needed to paint a car for $200. It's been a while since I sprayed some paint, but It will still look better than rolling it. I've painted my truck before in a friends shop. We just hung platic from the roof, set up a fan to pull fumes, then wet everything down to keep the dust low and had at it. It had some trash but not bad at all. From 5 ft. away it looked amazing, plus it was black. is gettin' ready for Bug'n! I did the roll-on paint thing. IMHO, it was too much work. I used rustoleum professional and you have to thin the paint down to milk-like consistency with mineral spirits for it to level out. You'll still get a little orange peel, so I hope you like wet-sanding. I took a week off from work and did my '72 Beetle and I spent most of the time sanding. Turned out a lot better than I thought though. Definitely a 5-10 ft paint job. You can see more of the progress pics here. Lasted quite awhile and I'm sure with a little DA polish I could bring a real good shine back, but my car's all stripped down for resto right now, so I'll be looking for a real paint shop soon. Any suggestions? Gumby, That looks DELISH. Total Beetle look with the roll on. I love it. And coming back to the roll on bed liner, if you put it on correctly, It can make your vehicle essentially vandal and storm proof. They did this to the "Dominator" that Reed Timmer drives for storm chasing. They took a baseball bat to it and it even bounced back so hard the bat hit one of them in the face. Not to mention, it can also look pretty good. Last edited by Mediarocker; April 26th at 02:32 AM. Thanks! That was before I even waxed it. Like I said, it's not a bad way to get some paint on your ride, but after all the prep work (fixing rock chips, dents), I probably would've just paid someone to spray it instead. You're supposed to roll on 2-3 coats, wet sand the orange peel, roll on 2-3 more, wet-sand, and repeat. Too much work. If I had another beater that needed paint, I'd do it for that, but I think my "classic" VW deserves a real paint job this time around. Maybe Samir could roll his Honda instead of going for the carbon fiber wrap? Time is the issue, so this would the least viable option, lol. The only reason I would want to wrap is because it's done in a day and can last as long as a mediocre paint job if not longer. I'd love to see what the wrap looks like when it's done. My boss's husband just bought a 1991 Jeep and mechanically it's as sound as a pound, but the paint is faded. They have a vinyl department in their shop and she told him to wrap it. So we looked up vinyl wraps online to get some ideas. You can actually get automotive grade paint in wrap now! Check this out. 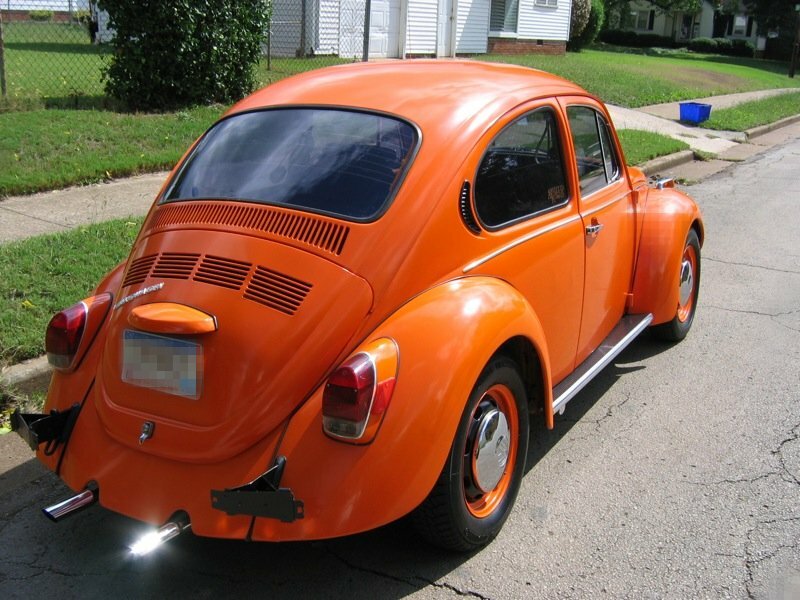 I'd wrap my bug, but WAY too many curves! You can actually get automotive grade paint in wrap now! Check this out. Very neat! Depending on how long it lasts, this may be the best way to 'paint' my car back to stock. And you'd be surprised what skilled installers can do. Exotics have a lot of curves and subtle styling elements, and there's companies out there that have made a whole business of doing just difficult jobs. I remember roll painting a cheap back in the day...It was definitely a 50/50 paint job. But, we were mudding it and didn't really care anyways. If I had to paint a truck that would be mostly mudding, I'd spray it with a mud-colored bedliner--then it would always look clean.